The fun keeps building with the Minecraft Card Game! Based on the hit video game, players have the opportunity to mine, craft, or reserve to win. 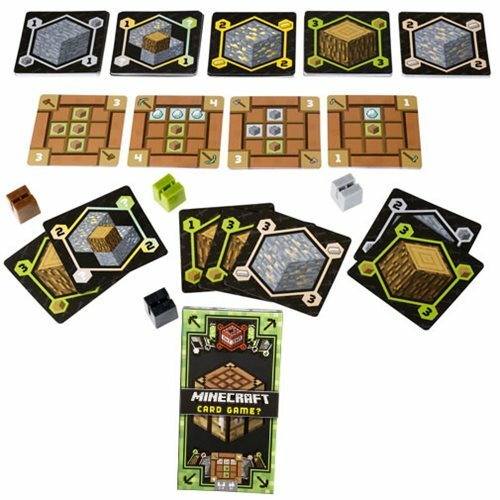 Players mine Resource Cards of Wood, Stone, Iron, Diamond, or Gold, and then use those cards to craft for points. If you desire a certain Craft Card, but are currently unable to pay for it, you may Reserve the card in your card holder to craft later. Craft Cards can become Tools with special powers you can you can use in your favor to control the game play, but watch out! TNT and Creeper cards are hiding in the deck for unexpected upsets. The player who reaches the game point goal first, wins! Requires 2-4 players. Ages 8 and up.